Something that’s been bugging me for a little while is…vinegar! Not just your normal brown malty stuff but the fancy ones which bring our beautiful plant based vegan salads to life. 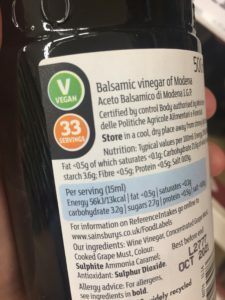 One particular vinegar which is a favourite in our house is Balsamic vinegar, which until recently I’d assumed was vegan. When I heard it could have gelatine in it, I started to do some research. I scoured website after website after website and frustratingly can’t seem to find a definitive answer to whether it is vegan or not. Some say of course it’s vegan and others state that it’s not. If you know please add a comment at the bottom, thanks. So……I decided to seek out the ones that quite clearly state that they are vegan to be absolutely sure and I found one really easily during my regular shopping trip! 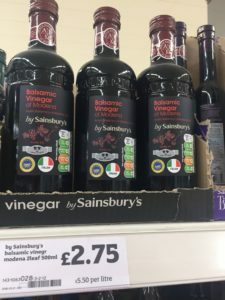 Sainsbury’s Balsamic Vinegar of Modena has the V for Vegan label and a 300ml bottle is £2.75. Job done and it tastes really good too. 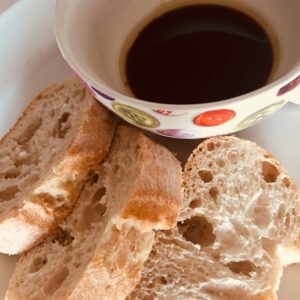 My 12 year old is a huge fan of it simply with olive oil and bread (as in the pic at the top) and I can’t say he’s wrong! I also add a dash to bolognaise sauce or make a tomato salsa with it. I’ll add a recipe for that soon! 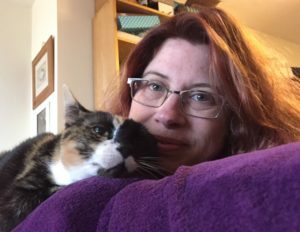 In the meantime….if you’re looking for money saving and cash creating ideas – join the friendly Super Savvy Vegan Facebook group. I’m also on twitter and Instagram.